Wonderful 2 bedroom appartment close to the beach. Perfect for delegates (7 minutes by bus from the Palais des Festivals) and tourists (10 min walk to the beach). Located in an historic building at the very end of a chic and popular road. This 2 bedrooms apartment of 71 m², South exposed, is located on the first floor without lift. It is equipped with WIFI and air conditioning in each room. A beautiful view on the greenery. You will not be bothered by the train thanks to the double glazing. Maximum capacity: 6 people. One twin bedroom, 1 closed a desk bathroom and a balcony. An other twin bedroom, 1 closed with bathroom. A big living room with lounge, balcony access, a big flat screen, terrace, sea view. A US kitchen well equipped for your stay. At the very end of the Croisette, Palm Beach is a neighborhood, from one hand very calm andperfect to take a walk, and from the other hand, full of activity. This is the perfect place to enjoysome water sports (Stand-up Paddle, Kite surfing, windsurfing, kayaking, etc ...) and meet localpeople on public beaches and boules player “Place de l’Etang”. There is also the prestigious PlamBeach Casino and nightclub, as well as the famous Baoli, the Mecca of Cannes-by-night. La Californie – where you can find all the most beautiful villas of Cannes. Most of these villas havea swimming pool and a breathtaking Mediterranean garden. While being close to the city centre,you are also surrounded by a nature when spending time on that hill overlooking Cannes. Duringthe day, there is a stunning sea views over the bay of Cannes. In the evening, the lights of the cityare offering a spectacular show. La Croisette, with its beautiful private beaches and its worldwide known palaces is the symbol ofFrench luxury. “The must” in Cannes, this prestigious promenade is also the ideal place for luxury shopping. Beautiful apartment in a great area. We loved the apartment and the location was super with great amenities and restaurants in the area. Great bus service at the top of the road so no need for a car. Beach very close. A very friendly neighbourhood. The apartment itself is in a quiet location which is ideal for a good night’s sleep. We met the owners who live next door. They are charming and helpful. On arrival the kitchen had not been thoroughly cleaned so the agency sent the cleaners back. We would definitely recommend this apartment for its quality and location. 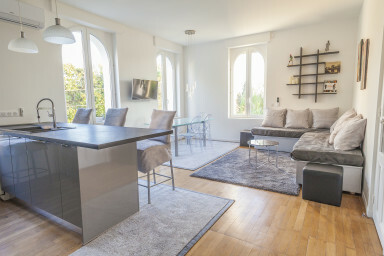 Great lication in Cannes, wonderful apartment, would definitely stay again, thanks!